PBS Democratic debate preview: Bernie’s chance to win over blacks and Hispanics. 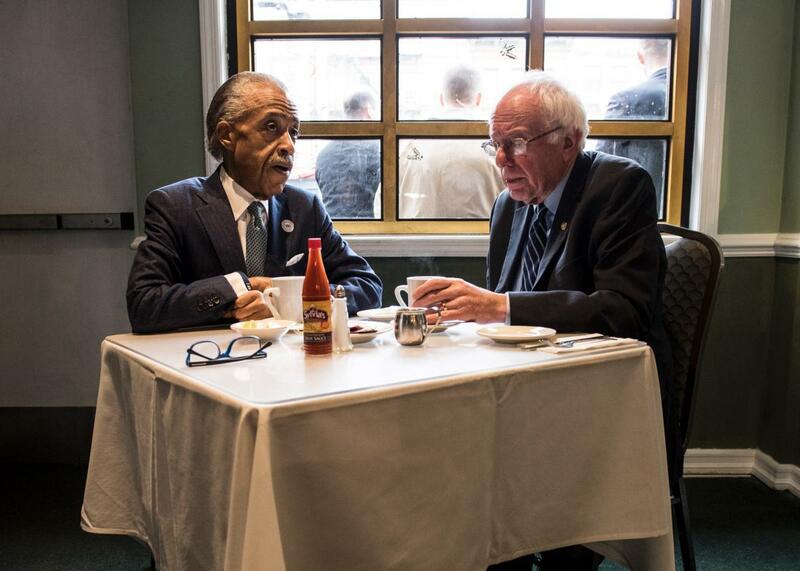 Bernie Sanders meets with Al Sharpton at Sylvia’s Restaurant on Wednesday in Harlem. No rest for the weary. Hillary Clinton and Bernie Sanders will square off on Thursday at 9 p.m. ET, only two days after Sanders won the New Hampshire Democratic primary by more than 20 points. The PBS-hosted debate will take place in Wisconsin, but both candidates will be more focused on Nevada and South Carolina, which hold the next two Democratic nominating contests later this month. Both of those states, as you may had heard by now, are expected to give Clinton a far friendlier welcome than she received in Iowa, where she squeaked out a historically small victory last week, and New Hampshire, where she received a historic shellacking this week. Nevada’s caucusgoers and South Carolina’s primary voters tend to be more moderate and far more racially diverse than either of the first two states on the calendar, making them the first significant test of Bernie’s ability to expand a base that skews white and liberal. Hillary, though, knows that a loss in either contest will raise serious concerns that her much-hyped firewall is no match for the Bern. Expect both candidates to step on stage on Thursday night prepared to talk more about immigration, police reform, and other issues that are particularly important to the Hispanic and black voters they now need. Rhetorically, the shift poses a greater challenge for Sanders, given he prefers to stick to his script about economic inequality and class while Clinton is generally better versed in the language of identity politics. As Slate’s Jamelle Bouie has explained, Hillary’s cultural familiarity with the black community in particular represents a powerful electoral advantage—and her campaign has made no secret that she hopes to use it to rebound as the nominating fight heads south. But as much as Sanders has struggled to speak as fluently about race as he does about class, he has proved himself capable of listening and learning, as we saw this past summer in his response to the Black Lives Matter protests at his campaign stops. At first, he retreated to more familiar income inequality territory. Later, he started placing a greater emphasis on racial justice and hired a young black woman who has been involved in the criminal justice reform movement as his national spokeswoman. He’s also picked up the backing of a handful of influential black intellectuals, including Cornel West, who endorsed him this summer, and the Atlantic’s Ta-Nehisi Coates, who said this week that he plans to vote for Sanders, albeit with reservations. Bernie continued his outreach efforts on Wednesday when he sat down with Al Sharpton at the same Harlem restaurant where the civil rights activist met with then-Sen. Barack Obama back in 2008. That’s not to suggest that a debate in Milwaukee between a white sexagenarian and a white septuagenarian will be all about race and ethnicity—it won’t. (I bet gender comes up too!) Clinton and Sanders will also try to hit their usual marks while framing the results of the past two contests in their own favor. But given what’s at stake in Nevada on Feb. 20 and South Carolina on Feb. 27, they’ll be eager to reintroduce themselves to demographics that weren’t very present in Iowa and New Hampshire. Hillary will start with the advantage. The question is whether she can keep it.